Shefford Town & Campton are nine points clear in the Premier Division supported by Sportsform after winning 4-1 at second place Cranfield United on Saturday. It was their ninth win on the bounce and ended United’s unbeaten home record. Ryan Lewis netted a brace and further goals from Sam King and Henry Snee did the damage - an own goal from Town’s Matthew Allen being the only reply. United, however, are nine points clear of Queens Park Crescents in third who returned to winning ways with a 2-1 home victory over Crawley Green Reserves thanks to strikes from Shahiaur Rahman and Mohammed Raheem Jabber against a Green reply via Callum Yates. The Crescents took over that third spot from AFC Oakley M&DH whose game at Ickwell & Old Warden will be subjected to a Beds FA and league inquest having been abandoned with less than five minutes to play. At the time the hosts, with goals from Scott Alleyne and Marko Tobdzic, were leading 2-0. Just goal difference behind M&DH in fifth spot are Wootton Blue Cross who won for the first time in five outings, 2-1 at home against AFC Kempston Town & Bedford College. 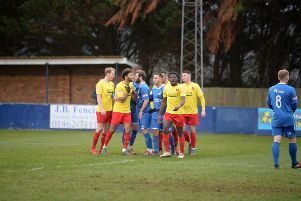 Antony Wright and Chris Butler were on their scoresheet against a Town penalty via Tom Vandenberg in reply. For Wilstead it was a 5-2 home victory over Caldecote who are now on a six game losing run. Paul Jones, Kevin Butler, Joe Sullivan, Tom Stonehouse and Lee Reynolds brought up the nap hand against a brace in reply from Jack Millar. 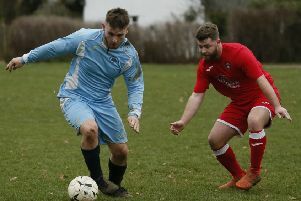 Also enjoying life on home soil and winning for the first time in five outings were Riseley Sports, 2-0 home winners over a Stevington side that had won its last five away outings. Marston Shelton Rovers are now unbeaten in their last five starts after winning 4-1 at Flitwick Town. Harry Murray led the way with a hat-trick and he was joined on the Rovers scoresheet by Ben Moore against a lone Town reply from Pete Rogan. Despite retaining their unbeaten away record Bedford Albion’s lead in Division One supported by O’Neills is down to just three points after they were held to a 1-1 draw at fourth place Biggleswade FC Reserves - who were duly extending their own unbeaten run to eight games. Kyle Jefferey netted for the hosts and Adam Lewis for the Albion. Second place Cranfield United Reserves are also still unbeaten on the road after a 2-1 success at Shefford Town & Campton Reserves, Callum Riches and Jordan Conway netting the goals against one in reply from Town’s George Mcgonagle. Third place Wixams returned to winning ways with a 5-0 home win over Sandy. Garath White with a hat-trick plus single goals for Jake O’Neill and Connor Saunders did the damage. Also back to winning ways were Totternhoe Reserves, 1-0 at Cople & Bedford SA who had won their previous five home games. George Capehorn netted the vital goal to claim the points. AFC Kempston Town & Bedford College Reserves ended their six games losing run with a 2-1 home victory over Flitwick Town Reserves who are still in search of their first away win. Martin Ivy and Emmanuel Akaka were on the home scoresheet against a lone reply via Sean O’Donnell. Christians in Sport (Luton) took their unbeaten run to four games in beating Wilstead Reserves 4-3 who are now on a six game losing away run. Sammy Okeke, Jamie Nolan, Chris Horncastle and Peter Wilson were on the home scoresheet against replies via Lino Altieri twice and Steff Jones once. 61FC Luton Reserves drew 2-2 at home against Lea Sports PSG. Shea Gentle-King and Lesile Medford netted for the 61 and Ali Mohallyaden and Joe Hennem replying for PSG. Houghton Athletic took themselves three points clear ain Division Two supported by Hy-Pro with a 3-2 victory at Caldecote Reserves. Jordan Thomas, Felix Sackey-Clarke and Mark Raffermati were on their scoresheet against home replies from Carl Heath and Jack Boyd. Second place Kempston Athletic lost their unbeaten away record afer losing 3-2 at Marston Shelton Rovers Reserves. Carl Borromeo, Garry Russon and Lorenzo Jordan netted for the Rovers against Athletic replies via Ashley Mattin and Lee Leonard. This Athletic defeat, combined with Meltis Albion sitting the afternoon out, allowed Elstow Abbey to climb just a point behind them awith a game in hand after their 7-0 home rout of CS Rovers. Dan Jeffries led the way with a hat-trick, Glen Tumulty netting twice and single goals being struck by Jason Allison and Kaylen Wilson. Now just goal difference behind the Abbey and the Albion in fifth are Atletico Europa who were also 7-0 home winners, over M&DH Clapham. Paddy Alimanji with a hat-trick joined on their scoresheet by braces from Mo Banda and Moses Gilson. Now in sixth spot are Sporting Lewsey Park who also hit seven in winning 7-2 at Black Swan (Luton). Chris Gibson claiming a hat-trick to go alongside single goals from Jason Dickinson, Luke Lincoln, Jonathan Barnett and Mark Raffermati against Swan replies via Joe Grossi and Danny McGovern. Whilst seventh place Luton Leagrave AFC were 6-0 home winners over Unite MK Reserves. Nicolae Covileac and Sam Cox both netted twice to go alongside single goals for Hartley Coleman and Melvin Uzomah. Following three straight wins St Joseph (Saturday) were beaten 4-3 at home by a AFC Oakley M&DH Reserves side who had lost their previous six games. Joe McDonagh, Bradley Duffet, John Hislop and Jamie Endersby were on the M&DH scoresheet against Joe’s replies via Jeff Thompson twice and Simon Richards once. Sundon Park Rovers’ quest for a home win continues after they were held to a 1-1 draw by Clifton who were duly ending a four game losing run. Bob McGrath were on the Rovers scoresheet and Ryan Parker replied for the visitors. It’s now 15 league wins on the bounce and a lead of 14 points in Division Three supported by Hy-Pro for Pines (Luton) following their 5-3 victory at Lidlington United Sports. Ryan Smith with a hat-trick and Nathan Miller with a brace brought up the nap hand against United replies via an own goal plus Oliver Pearson and Tom Staples. Second place FC Polonia (Luton) were 4-1 winners at Flitwick Town A. Grzegorz Rudnicki with a brace plus single goals from Milosz Harchut and Mateusz Krupczak were replied to once by Town’s Max Hughes. Now just a point behind in third are Real Haynes who won 7-2 at Dinamo Flitwick who were losing their fifth home game on the bounce. Josh Brown led the way with four goals and he was joined on their scoresheet by single goals from Ben Worbey, Bill Flack and Tyler Winter against home replies via Dale Goldie and Daniel Day. This victory lifted Real Haynes above Shefford Town & Campton A who fell to a 2-0 home defeat against Wootton Village, Aiden Medhurst and Nick Burraway were the Village goalscorers. Thurleigh who chalked up their fifth win on the bounce with a 5-0 victory at Real Haynes Reserves. Bradley Raines netting twice to go alongside single strikes from Kevin Harris, James Kimber and Dan Cullan. Harlington Juniors made it seven wins on the bounce with a 5-3 home victory over Wixams Wanderers. An own goal plus strikes from Tatenda Tapfuma, Jamie Small, Ben Whalley and Alex Frantelzzli were replied to by Wanderers goals from Tom O’Neill twice and Gavin Cheema once. Also hitting five in winning at home were Stevington Reserves who saw off Square FC 5-1. Dom Marino and Jamie Daniels with braces plus a single goal from Danny Lehon only being replied to once by Connor Taylor for the visitors.